LA JOLLA, CA–Neutrophils–short-lived, highly mobile and versatile–outnumber all other immune cells circulating through the blood stream. Yet, despite the cells' abundance, the progenitor cell that only gives rise to neutrophils had eluded all efforts to track it down. Now, researchers at La Jolla Institute for Allergy and Immunology identified a progenitor of neutrophils in the bone marrow of mice and humans and tied it to cancer-promoting activities. Their study, published in the August 28, 2018, issue of Cell Reports, found that neutrophil progenitors promote tumor growth and that the frequency of the usually rare cell increases dramatically in the blood of human melanoma patients. 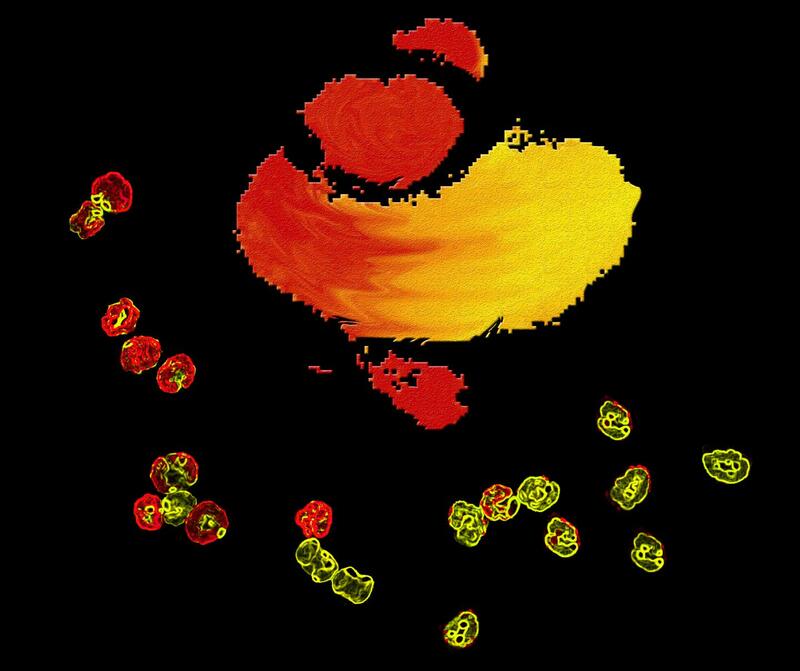 The findings could assist in the detection of cancers by serving as an early warning sign and drive new therapeutic and pharmaceutical approaches for the treatment of neutropenia, chronic inflammation and cancer. "For many years, the cancer immunology field has been really focused on T cells, which led to the development of checkpoint blockade and CAR-T therapies but there's a whole other arm of the immune system that plays a role in tumorigenesis," says Catherine Hedrick, Ph.D., a professor in the Division of Inflammation Biology, who led the current study. "We found that this particular subset of progenitor cells that promotes tumor growth and shows up in high numbers in melanoma patients. If our initial findings hold up across the board, a simple blood test could indicate if you have cancer or not." Neutrophils are among the first immune cells to arrive at the scene when pathogens breach the body's physical barriers. Equipped with powerful anti-microbial tools, they form the initial line of defense against infections by destroying microbes, mopping up debris and sounding the alarm that alerts the rest of the immune system to an infection. Neutrophils also play a critical role in chronic inflammatory diseases, including cancer. Despite their abundance and importance, researchers had been unable to trace neutrophils' lineage to their origin in the bone marrow, where multipotent hematopoietic stem cells give rise to a series of increasingly specialized progenitor cells that eventually differentiate into their target cell types, including red blood cells, lymphocytes and neutrophils. "Over the years, people identified different white blood cell progenitors but the one that was missing was the neutrophil progenitor because we didn't have the tools to pull the populations apart," says postdoctoral researcher and the study's first author, Yanfang Peipei Zhu, Ph.D. "Now, we can study disease where neutrophils execute unique and important functions and investigate further how certain subsets of them promote tumor growth." The successful search started with high-dimensional mass cytometry, which is also known as cytometry by time-of-flight (CyTOF). Immune cells are characterized by subtle differences in the expression of a multitude of markers. Each combination serves as a unique cellular ID that allows scientists to distinguish between different types of immune cells. CyTOF allowed Zhu to simultaneously analyze 39 surface markers known to pinpoint hematopoietic stem and progenitor cells, transient myeloid precursors, and terminally differentiated myeloid cells, especially granulocytes, the subset of immune cells neutrophils belong to. The high-dimensional bird's-eye view led to the discovery of a previously unknown progenitor population with neutrophil characteristics. In vivo adoptive transfer approaches confirmed that this progenitor gives rise only to neutrophils, bringing a decades-long search for a committed neutrophil progenitor to its successful conclusion. Once the mouse neutrophil progenitor had been identified, Zhu and her colleagues were able to track down an equivalent neutrophil progenitor in healthy human bone marrow. When transferred in mouse cancer models, both the murine and human neutrophil progenitors promoted tumor growth. "It seems this progenitor works through T cells, possibly suppressing them and turning them off but we still need to look at the mechanism," says Zhu. "It could be one of the factors that have an impact current immunotherapy by making them less efficient." Surprisingly, when Zhu compared the blood of healthy people and patients recently diagnosed with melanoma, she found elevated levels of circulating neutrophil progenitors. Zhu is now trying to determine whether the same holds true for other cancers as well. "If so, it could be used as a simple biomarker for early cancer discovery," says Zhu. The study was supported in part by the La Jolla Institute for Allergy and Immunology, NIH grant 1S10OD018499-01, the National Cancer Institute Cancer Center Support Grant P30 CA168524, NIH grants R01HL134236, P01HL136275, and R01CA202987, as well as ADA7-12-MN-31.